Exercise and diet are the two main ways to reduce weight or fat. In fact just controlling your food intake without any exercise can result in dramatic weight loss. (Learn more about our Nutrition program). On the other hand, exercising daily without a sensible diet will produce minimal, if any, change in body weight. You may even continue to gain weight! And the weight loss difference is indiscriminate in nature - from all body tissues, not just fat. What we really desire is discriminate weight loss. That is, just from the fat stores, while preserving lean, metabolically-active, calorie-burning tissue. Combining diet with the right type of exercise can make a monumental difference in the results of your fat-loss program. It's like a turbocharger for fat loss. 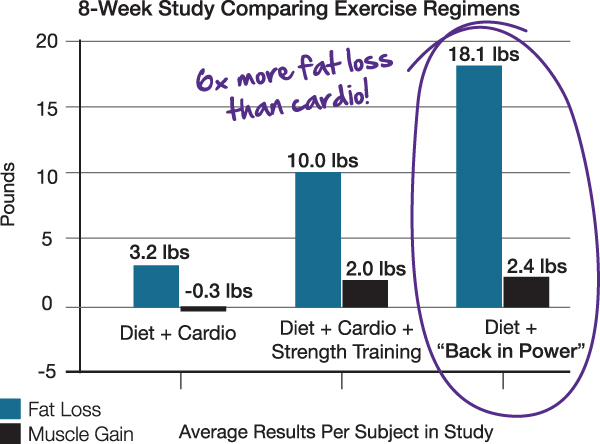 This graphic illustrates the dramatic difference that the Back In Power training program makes on fat loss compared to other common exercise routines. This study compares the results of various fat loss regimens using a similar diet over an eight week period. The diet and cardio group lost weight indiscriminately - both fat and muscle. The diet, cardio, and strength training group fared much better, with over three times the fat loss over the diet and cardio group, combined with a moderate muscle gain. A Back in Power workout lead to fat loss nearly double that of the diet, cardio, and strength training group, and almost six times that of the diet and cardio-only group. And they gained more calorie-burning muscle! Fat loss and fat gain are both caused by hormonal metabolic events. This means that exercise and diet must work together to create the correct hormonal balance to encourage fat loss. Strength training also helps shape and 'tone' your body by enhancing muscle definition through fat loss. Exercise should also be safe. In fact, safety must be the most important factor in an exercise program. If you get injured while exercising, you end up being in worse shape than when you began.